Swinford Golf Club is a delightful mature parkland course in a beautiful setting. With mature trees coming into play requiring accuracy off the tee before playing to well protected greens. A stream comes into play on the 3rd 5th and 6th the course is always kept in the best of condition and the hospitality and friendliness of the members has to be experienced to be believed. Founded in 1922, measuring 5502 metres Par-70 with a standard scratch of 68. The course record is a fine 65 shot by L. Halpin. Instituted 1910, affiliated 1922. 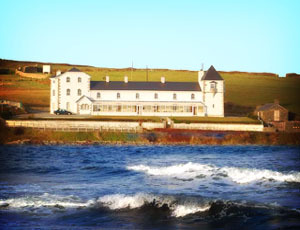 The present course at Swinford was laid out by Major Benson of Rosses Point in 1930. There is some confusion as to when golf was first played at Swinford; 1917 would appear to be the likely date. In April 1919, land was leased from the nuns in the Convent of Mercy, in an area known as Brabazon Park, was leased as a public park. The 50th Anniversary brochure of the club records "The newly arrived nuns were astonished at the sight of reputable citizens, hitting a little white ball round the park" During the troubles, the Argyle and Sutherland Highlanders, who were billeted in Swinford, took their time off on the golf course and the local IRA retaliated by ploughing up the greens. The club affiliated to the GUI in 1922, and the first recorded officers were Captain, C. A. Bowles, and the Hon. Secretary was Paddy McManus. Swinford Golf Club were runner-ups the Connacht Shield when they lost to Ballinasloe Golf Club by 6 matches to 4 matches on Saturday 7th October 2006.The first leg was played at Swinford Golf Club on Sunday 1st October with Swinford taking advantage of their local knowledge to record a 3 and 2 win over the visitors. First up were Brian Conneely with Tony Broderick against Eamon Byrne with Brian Reynolds when the Mayo men won their match on the 19th. They were followed by Declan Murphy with Declan Flannery who lost out to Tomas and Sean Geraghty by 2 and 1. Next up were Brendan Naughton with Ollie Colgan against Charlie and Cathal Quinn again the match went to the men from Swinford by 3 and 2. Dermot Dunican with Frank Donohue beat Michael Rooney with Niall O’Neill by 2-holes, the final match saw Enda Finn with Mark Conneely beat Declan Loftus with John Kelly by 4 and 3. The Second Leg was played at Ballinasloe Golf Club on Sunday 7th October where Ollie Colgan now partnered with P. Whelehan lost out to Eamon Byrne with Brian Reynolds by a single hole. They were followed by Brendan Naughton with Mark Conneely had a convincing 4 and 3 win over Charlie and Cathal Quinn. Next up were Dermot Dunican with Frank Donohue who trashed Tomas and Sean Geraghty by 8 and 7. The penultimate match of Tony Broderick with Brian Conneely had a comfortable 5 and 4 win over John Kelly with D. Ronayne. The final match of Declan Murphy with Declan Flannery against Declan Loftus with D. Fadden ended with a 2 and 1 win for the Galway men. E. Connor won the Connacht Veterans Open Championship at Oughterard Golf Club on 13th September 2006, when he returned rounds of 78 and 75 to beat B. Eriksson (Hassleholms G. C.) on a count-back, with Greystones Eddie Condren a shot further back on 154. 2004 Lady Captain Julie Loftus (16) and her Captain's Prize Winner Patricia Lavin (17) were qualifiers with 36 pts. in the Volkswagen-Irish Independent Lady Captain's Classic at Co. Sligo Golf Club in August 2004 they qualified for the National Finals at Hermitage on 4th October. Swinford Golf Club won the County Cup at Ballina Golf Club on 12th September 2002 when the team was John Kelly, Matt Duggan, John Rooney, Darren Fadden, Michael Rooney, Enda Gurren, Brian Reynolds, Eamonn Byrne, Niall O’Neill, Ivan Maloney and they were captained by Tom Regan. The team were 18 shots clear of Ballinrobe the runners up. Swinford Golf Club, were Connaught Shield Finalists in 1995, when the team was, Eamonn Byrne, Kevin Grealy, John Condon. Tom Regan, Cathal Quinn, Willie Kavanagh, Tony Spain, Padraic Buckley, John Forkan, Niall O'Neill, John Kelly, Charlie Quinn and Ted Lawless. They were captained by Donal Benson and managed by Owen Roe O'Neill. They won the G.U.I. Connaught Aer Lingus Club Youths in 1983. The Kenny Cup in 1982. Swinford won the Connaught Irish-Schools Championship in 1980 and 1979 and the Connaught Smurfit Juvenile Girls Golf in the same years. Aidan Benson played Connaught Youths' in 1981. Niamh O'Neill played for the Irish Girls' in 1979. Joseph Gallagher won the Co. Mayo Junior Cup tournament at Westport Golf Club in September 2001.